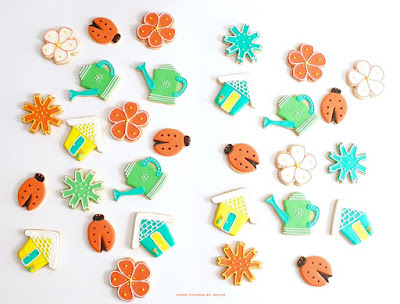 Bright, colorful sugar cookies inspired by the garden take on such a charming appeal when you make several shapes. Last year I made a set of cookies for a dear friend who is an avid gardener, and this year, I was asked to recreate the shapes using a variety of cheerful colors. 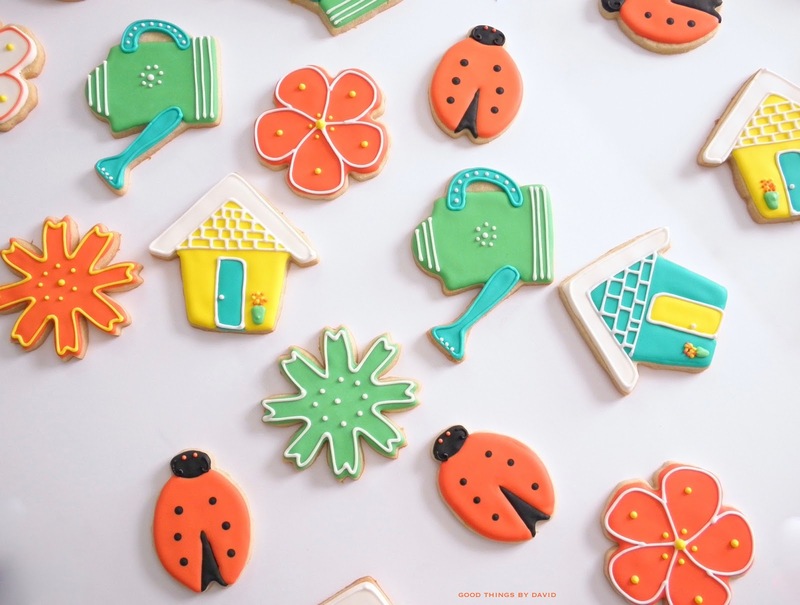 With flowers, ladybugs, watering cans and garden sheds, you can easily plan an outdoor party or an open house, and have decorated sugar cookies for guests. 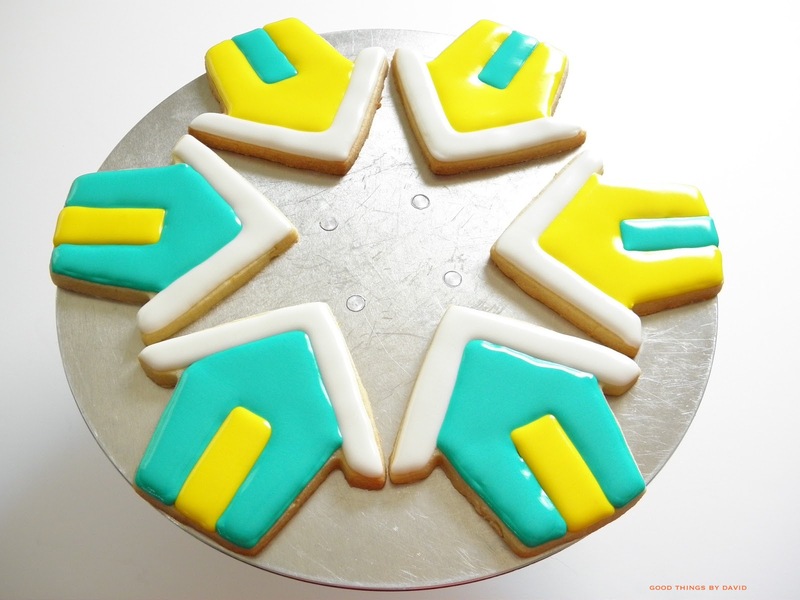 This particular set of cookies were cut out with a variety of cookie cutters from my collection. 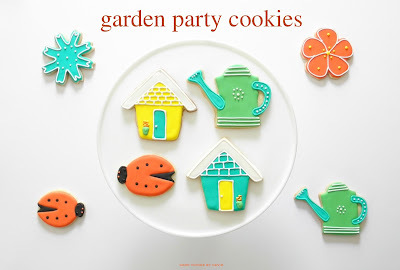 The flowers and watering can were part of a set from Macy's under the Martha Stewart Collection brand, the ladybug was from the Martha by Mail Beautiful Bug Cookie Cutters Set, and the garden shed is the Birdhouse Cookie Cutter by Coppergifts. 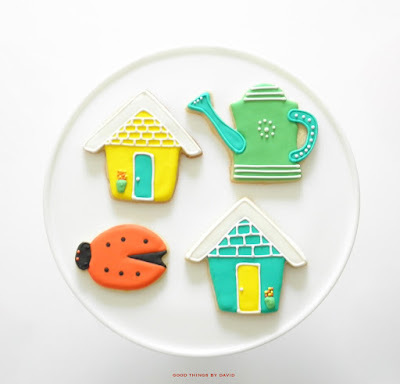 With a range of colors of royal icing, the cookie designs can be iced with a minimum of effort. Chances are that you've encountered a ladybug or two, or more, while out in the garden. 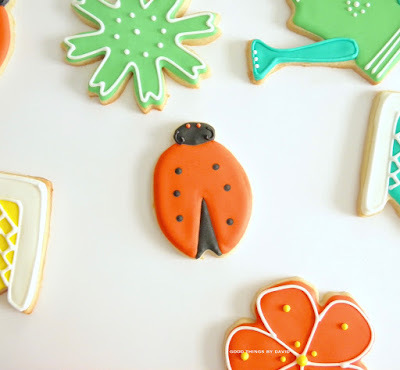 These beneficial and useful beetles which feast on garden pests such as aphids, can quickly be made into decorated sugar cookies if you follow a simple design. 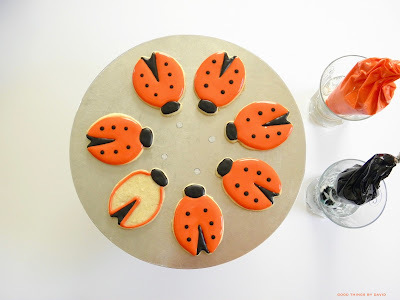 Their bright red or orange color, and black accents, are easy to mimic in cookie form. 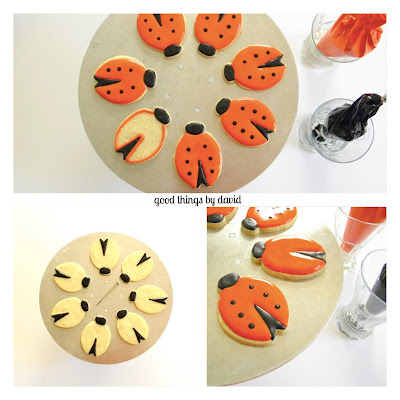 Cut out the ladybugs using your cookie cutter and outline and flood an oval head in black royal icing using a #3 plain piping tip. Outline and flood a triangle toward the bottom of the cookie to designate the parting of its wings. Note: that tiny tool in the center of my rotating cake stand is the mini screwdriver from an eyeglass repair kit. Look for them at the check out of your local grocery store and buy one to have just for cookie decorating. 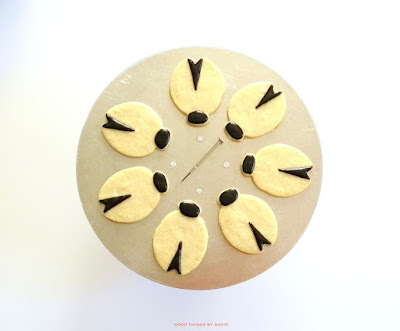 This helpful tool will make it easy to create accents in your royal icing or pop out air bubbles. Outline and flood the wings of the ladybugs in either red or bright orange royal icing using a #3 plain piping tip. While the icing is wet, add dots along each wing. Let dry completely. 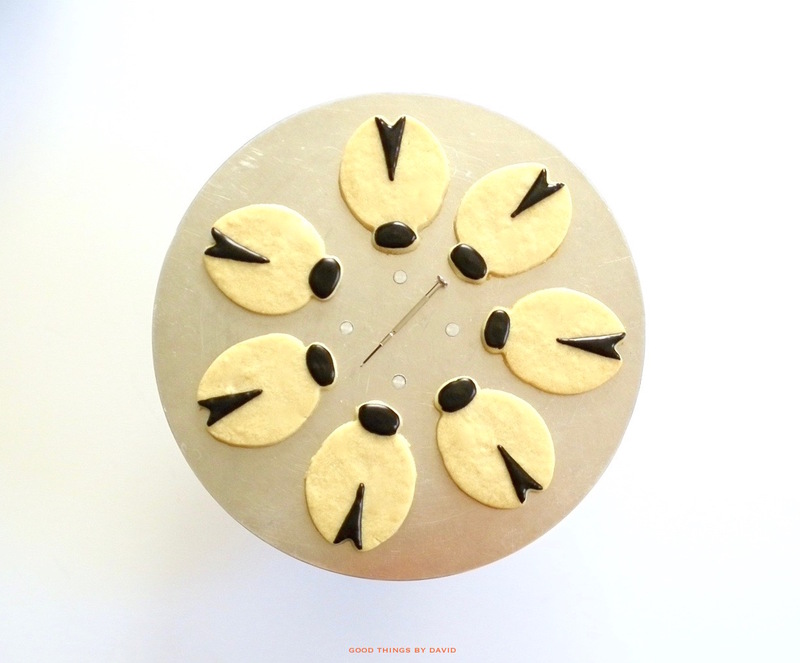 Once the icing has dried, pipe two small dots for eyes and small antennae along the sides. Done! The garden sheds are also quite simple. 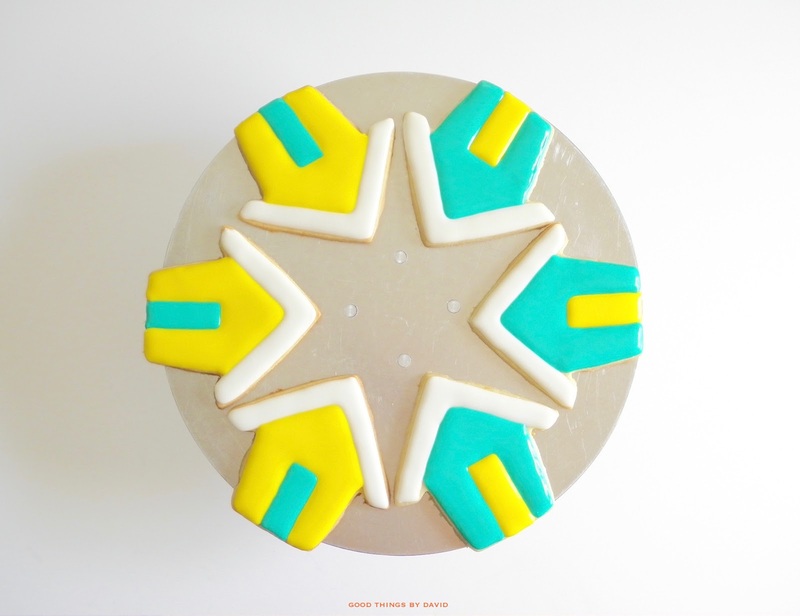 Outline and flood the roofline in white royal icing using a #3 piping tip. Outline and flood a doorway in either bright yellow or turquoise royal icing using a #3 piping tip. Outline and flood the facade of the garden shed in a contrasting color using a #3 piping tip. Let the bases dry completely before continuing. I love how these colors pop with hints of spring. Add a trellised siding underneath the roofline using white icing and a #2 piping tip. 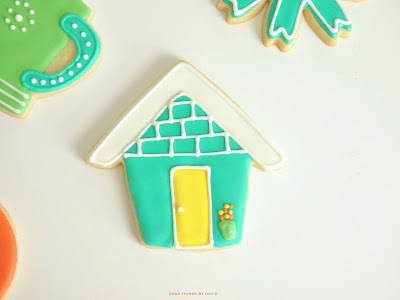 Add an outline to the doorway in white royal icing using a #2 piping tip and add a dot for a door handle. Outline the roofline with white royal icing using a #2 piping tip. For the pot of flowers, pipe a small pot shape using light green royal icing and pipe small dots in yellow and orange to mimic flowers. Let this dry completely. 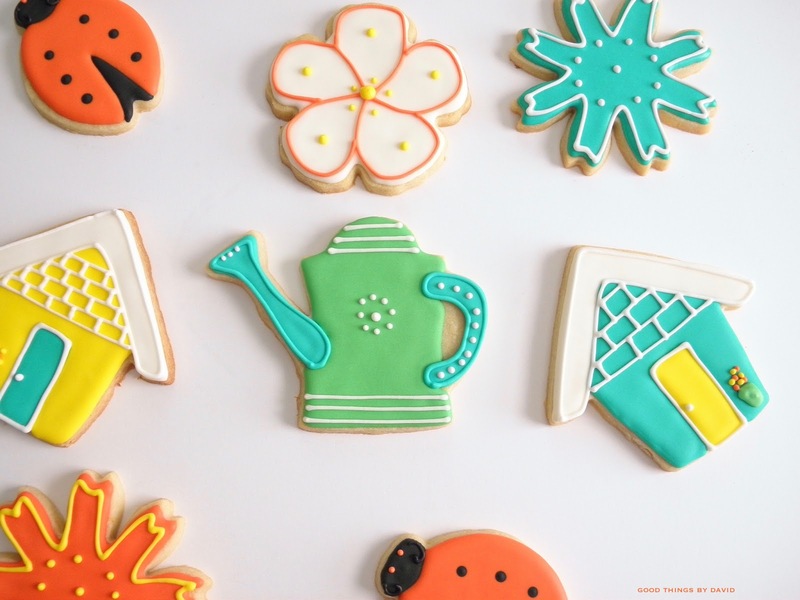 For the watering cans, outline and flood the spouts and handles using turquoise royal icing and a #3 piping tip. Let this dry. Outline and flood the rest of the watering can in light green royal icing using a #4 piping tip. Let the bases dry completely. 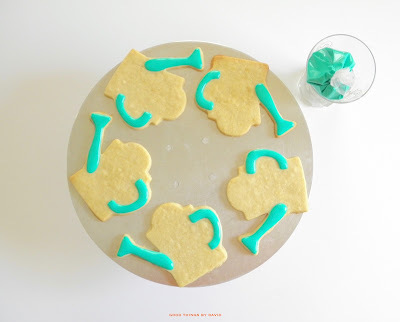 Outline the handles and spouts using the same turquoise royal icing and a #2 piping tip. With a #2 piping tip and some white royal icing, add stripes at the base of the watering can and across the lid. Pipe a flower in the center of the can using simple dots. Pipe three dots at the head of the spout and dots along the handle. Let these dry. The flowers are very, very easy. Outline and flood the bases in any color, such as bright orange and white, and let them dry. Using a contrasting color, pipe the outlines of the petals and add dots where you see fit. A color palette like this very appropriate for spring. Choose colors that are exuberant and happy. Spring is all about color and about being outdoors in the garden, planting, pruning, sprucing up and planning for the months to come. 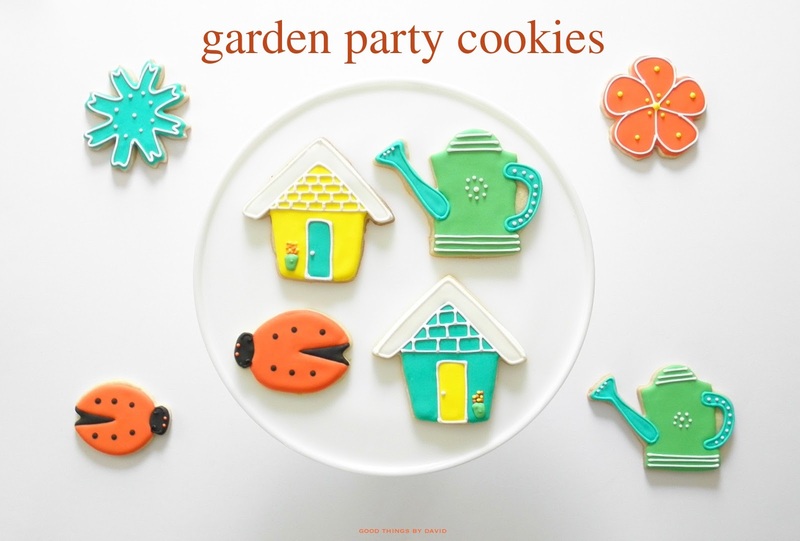 Bake and ice some garden party sugar cookies to get you in the mood for entertaining outdoors this season. Display the cookies on a dessert table atop cake stands or platters, and have cellophane bags at the ready for anyone who wants to take them home. If you want to make some for a bake sale or for a shop to sell, carefully place them in cellophane bags and tie them with some natural garden twine or some green raffia. These cookies aren't going to last very long because everyone is going to want them. By far... my favorites! I love the brilliant colors! Happy Spring and happy gardening!